The fourth Scottish Mountain Biking Conference brought together representatives of government, major stakeholders, mountain bike advocates, industry reps and academics for three days of presentations, films, workshops and rides, all with the theme of planning for the future of mountain biking in Scotland. For us journalists though, the fun began earlier in the week, as we were whisked up the A9 to Aviemore before being treated to a couple of days of guided rides, full Scottish breakfasts, afternoon tea and cake, and a cracking opening party at a home-built gin distillery. The riding in the Cairngorms is varied and spectacular, but it’s also one of the most important places in the UK for threatened species and ancient woodlands, and this tension between enjoying the outdoors and minimising impacts on it was to be one of the recurring themes of the week. The strategy is backed by the Scottish Government, who were represented by Fiona Hyslop MSP. 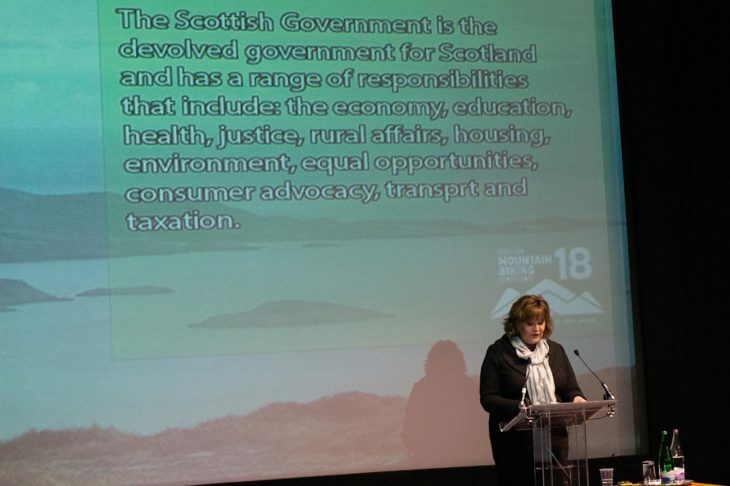 While she didn’t don a plaid shirt for her presentation, the list of facts and figures she reeled off showed that the government are clearly aware of the contribution mountain biking makes to Scotland’s wellbeing and economy. To give just one example, the World Cup event at Fort William alone generates £3.5 million for the country each year. Cycling sport’s governing bodies were also represented at the highest level. 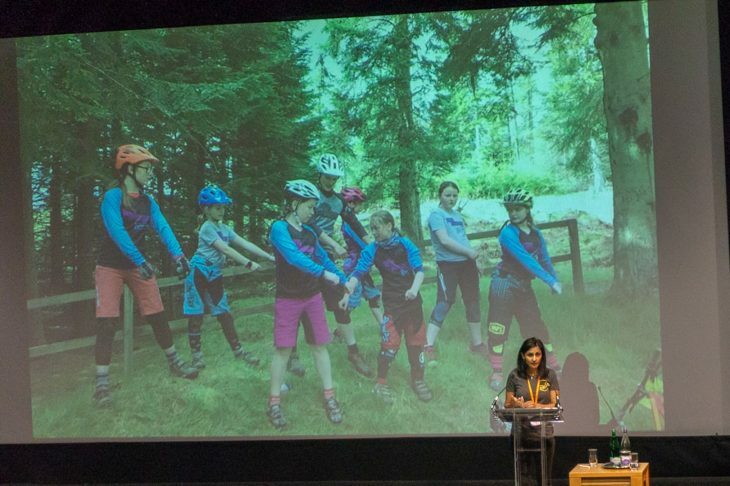 British Cycling’s CEO Julie Harrington gave a well-received talk which expressed an intention to support mountain biking in the rest of the UK the same way as Scotland, with more facilities, more qualified coaches and increased participation. 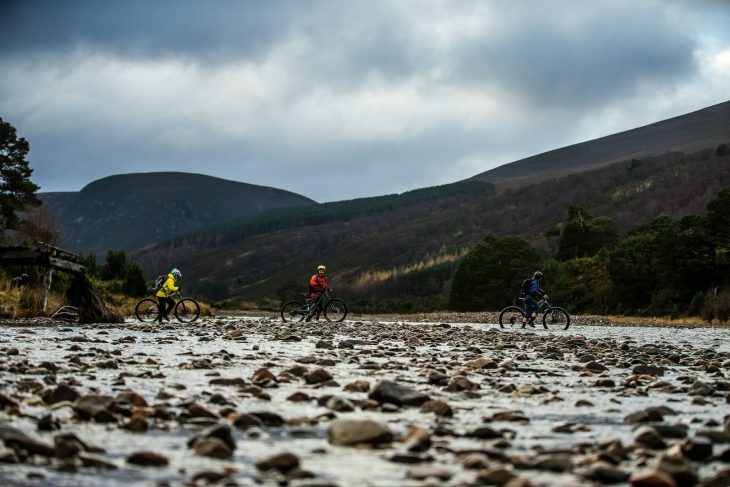 In Scotland, the catalyst for much of mountain biking’s growth over the past decade was the creation by Scottish Cycling of a semi-independent organisation, Developing Mountain Biking in Scotland (DMBinS). 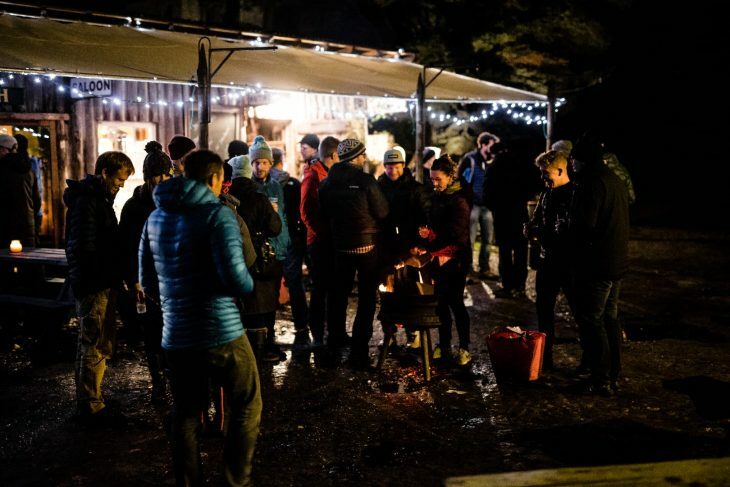 DMBinS organised the biannual conference, produced the Strategy for Scottish Mountain Biking, and supported much of the post-Seven Stanes trail development in the country. It now seems like British Cycling is taking notes, with an eye to copying the model in the rest of the UK. DMBinS was also behind another key document launched at the conference and discussed by representatives from the National Access Forum and Scottish Land and Estates. Titled “Unauthorised Mountain Bike Trails: A guide for land managers and riders” it sets out a framework for managing unofficial, rider-built trails safely and sustainably. The growth of these trails has become a hot topic in Scotland as, thanks to the country’s access laws, once riders build a trail it becomes extremely difficult to prevent them, and others, from using it. 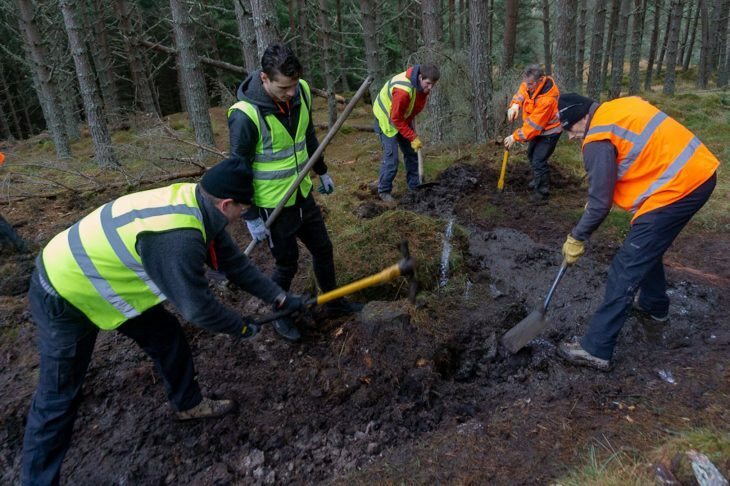 In some places such as the Tweed Valley, builders and land managers are starting to work together to maintain and manage the off-piste trails. In other areas, the picture isn’t so rosy, and unauthorised trails have been built through habitats for endangered species like the capercaillie, creating major issues for conservation bodies. The final day of the conference was given over a “Trail Summit” with some innovative ideas as to how to tackle these issues, and EWS organiser Chris Ball gave a joint talk with South African trail builder Fanie Kok, describing some of the methods they’ve used to engage mountain bikers and teach them about trail stewardship. Fanie (left) and Chris (centre) chat trail maintenance with the locals. The other hot topic of the conference was ebikes. 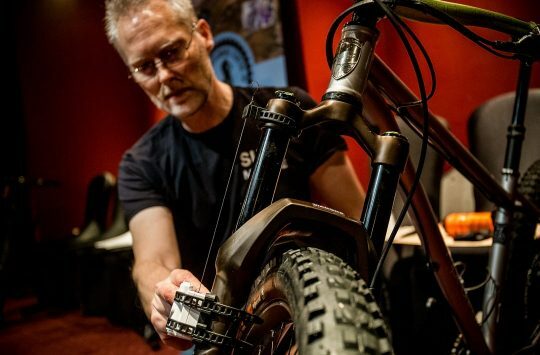 Cube’s Neil Walker delivered a basic primer on the new technology, which included the eye-popping statistic that soon almost 40% of their sales are expected to be ebikes, with a fifth of these eMTBs. Kevin Mayne from Cycling Industries Europe gave a presentation which also focused the transformative potential of ebikes, citing them as the next great growth area after mountain bikes took the industry by storm in the 1980s, and stressing the importance of effective industry organisation and lobbying to ensure they don’t get squeezed out by other hi-tech mobility options. There was plenty of discussion of the challenges presented by ebikes, but it was also clear that for most people at the conference, the new technology has achieved a level of acceptance that seemed a long way off just a couple of years ago. The big name of the conference was the irrepressible Claudio Caluori. His company Velosolutions are now building pump tracks across the world, including one each year, free of charge, in some of the world’s poorest countries, but his talk had a relevance closer to home. 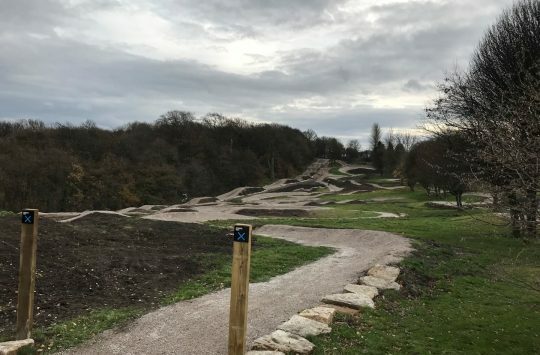 Many of Scotland’s new trail projects in the past 10 years have been pump tracks and urban trails, and he made a persuasive argument that the BMX-riding kids of today are the mountain bike champions of tomorrow. The final thread running through the conference was inclusivity and diversity. Mountain bike guide Aneela McKenna gave a great talk on how to make mountain biking more welcoming for women, which drew on what she called her “grown-up job” as Equalities Manager at the Scottish Parliament, while conference host Lee Craigie was able to give her own perspective on some of the issues discussed. If two days of being sat in a warm conference room started to wear thin, the organisers had laid on plenty of extracurricular activities, including night rides, a celidh which saw Scottish mountain biking’s movers and shakers “gie’in it laldie” to Auld Lang Syne, and the annual Scottish Mountain Biking Awards, one of the events that contributes to a supportive, tight-knit scene (barring the odd sweary outburst from a losing nominee). The final day of the conference was given over to a Trail Summit which combined more talks with a bit of a practical. IMBA Europe’s Mark Torsius spoke about the development of a pan-European trail standard to ensure consistently high quality facilities from country to country. 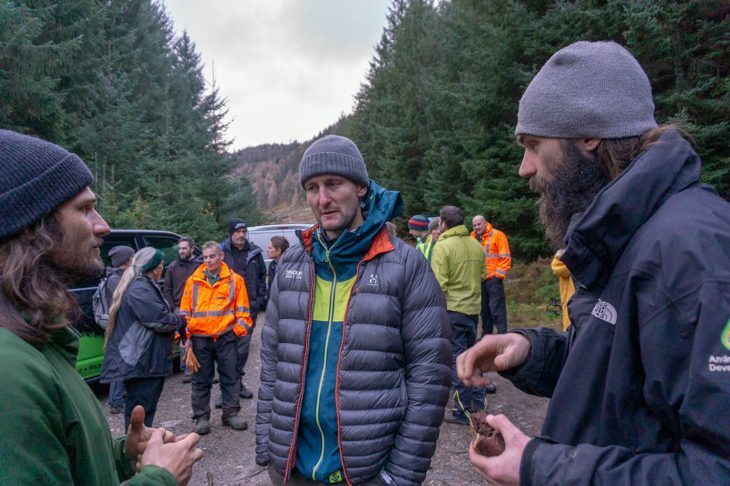 John Ireland, Forestry Commission Scotland’s Safety, Health and Environment Manager outlined some of the issues that the recent proliferation of wild trails has created, pointing out that FCS faces £10 million of liability claims each year, principally as a result of mountain biking. Fortunately the gathering didn’t end on this note. 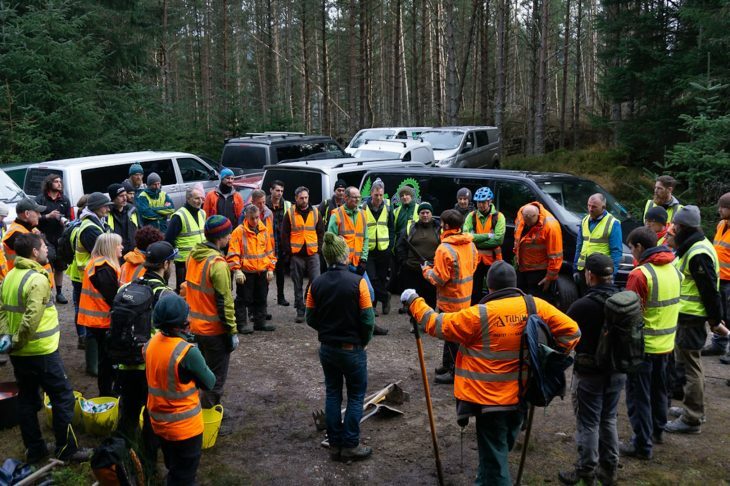 After a short break we piled into minibuses and headed out to Laggan for some trail maintenance. In keeping with the previous discussions at the conference, it wasn’t at the trail centre. A selection of nearby unofficial trails had been picked for us to work on, and after a safety briefing from John and an introduction to the local trail crew, we set to work improving drainage, closing desire lines, benching and berming corners, and doing other work to make the trails more sustainable. It was inspiring to see staff from big land managers including the Forestry Commission and National Trust for Scotland, stars of the mountain bike world like Chris Ball and Hannah Barnes, and ordinary mountain bikers all working together on trails that might have been viewed purely as a nuisance or a liability risk a few years back. 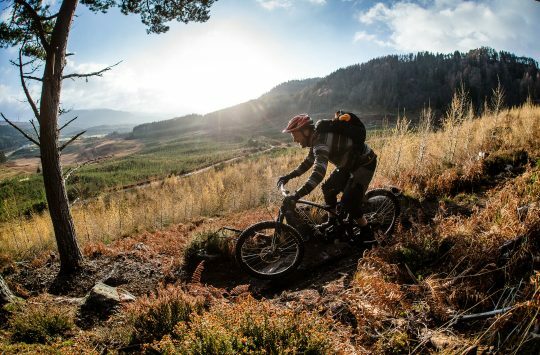 There is huge support for mountain biking in Scotland, and it’s more than a draw for adventure tourists – it’s increasingly becoming part of its culture, economy and national identity. Many of the initiatives showcased at the conference were genuinely innovative and progressive, and there was a real sense of optimism for the future. The irony is that the funding for the organisation behind the conference is less secure, and there’s a risk that this year’s could be the last one. Hopefully though, we’ll be able to report back in two years on another exciting round of developments in Scottish mountain biking. Antony’s trip to the Scottish Mountain Biking Conference was paid for by DMBinS (Developing Mountain Biking in Scotland). One of the reasons I would like to move to Scotland! Wonderful to read all this stuff, and yet still I cannot persuade the family to move to Happy-more. On a different note, that South African fella’s got an interesting name. Fanie Kok? Blimey!